I was really looking forward to reading Anatomy of a Misfit, especially when I discovered that the book was based on actual events that happened to the author. Anika was a really interesting character, she was snarky and sarcastic, popular and pretty, but deep down she was something else entirely. It did take me a bit to warm up to Anika, as she does some things that were really disappointing. But she also surprised me when she did something completely opposite, like standing up for the underdog. I felt like I never really knew what to expect from her, and I flew through the pages to see what she was going to do next. She wanted to do good things, she really did, but she wasn’t willing to risk losing her status to do so, unfortunately. 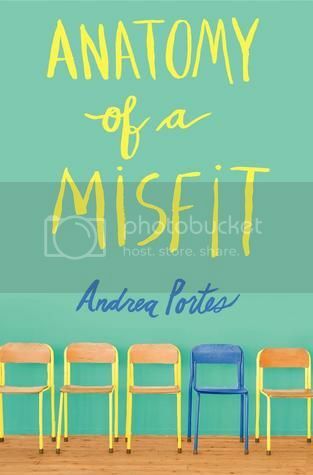 Anatomy of a Misfit is one of those books that will really make you stop and think, “Is it worth it?”. Was it worth it for Anika to be part of the popular crowd? To just do the things she did so that she wouldn’t be shunned by the people in her school, at the hands of her bully best friend? Is it worth it to instead go along with the bully and feel like crap for the things that you do? I remember being in high school, and it definitely is a tough time. But there’s one thing to always remember, these people you go to high school with, you will most likely never see again after graduation. So why do anything you don’t want to do to impress someone else? I wanted to shake some sense into Anika throughout the book to make her see this point. The book was definitely written for a different time period, which I assume was close to the time of the authors’ youth. There is no mention of cell phones, computers or anything modern. That doesn’t take away from the story at all, however. The book had its moments and gave me a mix of emotions. I laughed, I sighed, I felt disappointed, I teared up a bit… It made me feel all these feelings in such a short amount of time. The ending of the book was both heartbreaking and hopeful. What I found most interesting about this book was that it was a semi-autobiography. And I thought my high school years were wild! Overall; Anatomy of a Misfit was a really interesting read. It’s definitely a book that will make you stop and think. I am really looking forward to reading more by this author in the future! I like that the book brought out different emotions in you! And I always appreciate a story that makes me take a moment to think. I'll have to bump this one up on my TBR pile! This sounds like a really interesting book! Knowing that it is a bit realistic, as in based on events that happened to the author makes me all the more intrigued. Another book like this one I loved is Noughts and Crosses by Malorie Blackman. Sometimes people will do anything to be in popular crowd.